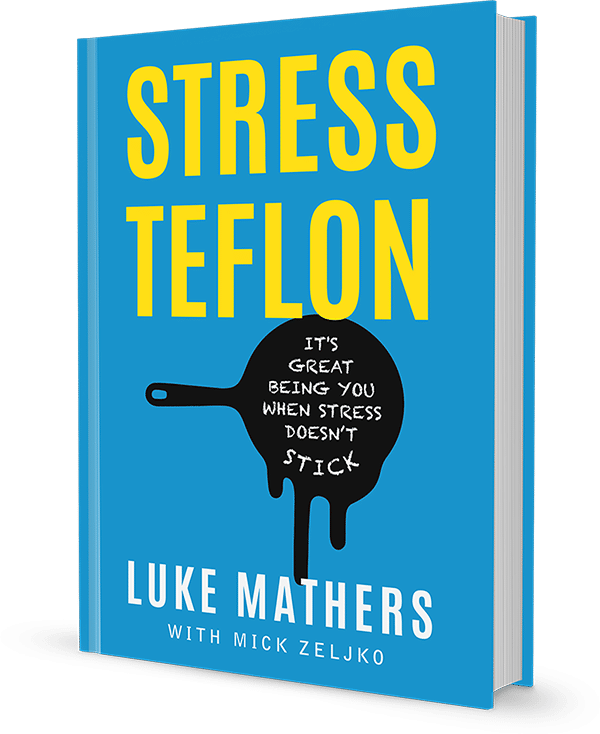 Challenging, confronting and insightful, a keynote speech from Stress Teflon author Luke Mathers will give your audience a memorable experience that will change the way they think about stress forever. Packed with stories and easily digested science, Luke delivers an entertaining insight into stress and how people tick. His strategies provide the tools we need to improve productivity, performance and happiness in all walks of life. Imagine a workplace where problems are seen as challenges, differences of opinion are encouraged and where the entire team are fired-up to jump the next hurdle. This is what happens to businesses after attending Luke's stress intervention workshops. Using the principles of Stress Teflon, these workshops are customised to develop a mind-set that "Stress is Good..... get better at it". The workshops are interactive and challenging and will develop skills that can be used in all aspects of life. It's good being you when stress doesn't stick. Carlos: What are the characteristics of the better version of you. This is fun! It makes people name and identifies what the better version of them looks like. In this module, we also look at the concept of Progesstination. Doing easy positive things instead of tackling the difficult ones that may result in failures. In this module, you will understand the importance of tribes in any organisation. Investigate the changing roles when transitioning from High Power to lower power. Investigate why poor middle management will amplify stress in both directions. Discover ways to promote the safety of a tribe. Self-deception bubble. When do you kid yourself? Look at our natural tendency to rationalise, justify and live in denial. Participants must identify something they have done that didn’t correspond to their inner values and how they talked themselves into it being ok. It can be a bit confronting, but it will put you in the room of mirrors for a good hard look at yourself. When did you fake it? Power poses, posture and the way we hold our body have a two-way communication with our brain. In this module, we look at the relationship between our body language, stress and how our brain ticks. We will do a body language audit and some experiments to show how you can consciously beat the system. Humans have habits to make life easier and more automatic. In the habit audit, we look at identifying the ones that work and ways to eliminate the ones that don’t. There are a few tricks that will help you develop pride from inside and create habits that will last long after you leave the workshop. Nobel Prize-winning author Daniel Kahneman has discovered an ingenious fact that will change your priorities of customer service. We will learn about Peak-end theory and look at how it applies to everything about customer service. Learn how vulnerability will give leadership authenticity and effectiveness. The idea that the leaders know everything is crazy, yet, so many people in leadership roles feel they have to portray this image. This module will challenge this thinking and investigate the benefits of being vulnerable. Ever wonder why the joy of hitting your sales target is so fleeting? Why completing a major project feels good but only for a moment. In this module, we look at Dopamine addiction. Why selfish goals are not as fulfilling as communal goals and how to change it. Leaders who embrace stress will get people talking and make it safe to do so. When staff don’t feel safe, their survival instinct tells them to do (and say) nothing. This module will give leaders the tools they need to make people feel safe and get people taking. Frontline staff usually have great ideas; they just won’t share them unless they trust and feel safe with their leaders. The hippies were onto something with meditation and yoga. The problem is their message got lost with the incense and dodgy renditions of Kumbaya. In this module, we will learn how Mind-awareness can be a key to becoming stress Teflon. Understand “what am I thinking? Why am I thinking it? Is it helping?”. You don’t have to sit cross-legged on the floor and chant to develop mind-awareness.